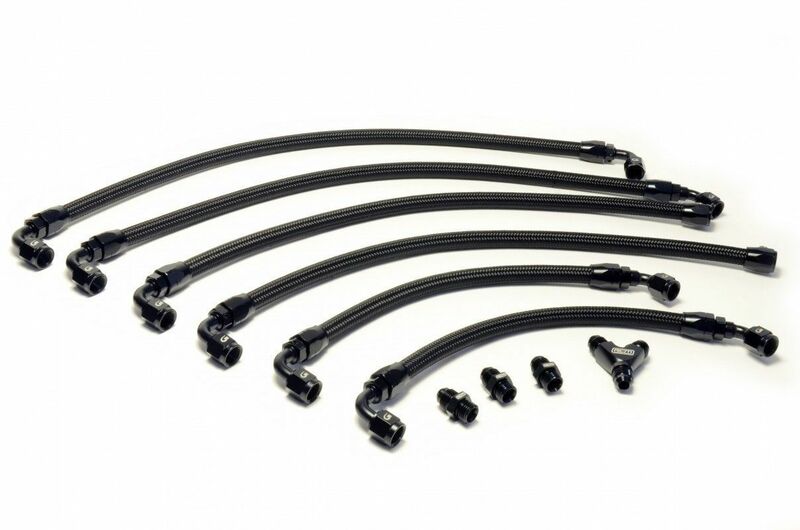 RCM Billet Fuel Rails are the perfect addition to any performance engine project. These billet rails are designed and manufactured to cater for earlier side feed injectors where the need for improved fuel feed and routing is paramount. With Subaru's standard fuel system design, fuel is fed by a pump from the tank to the front of your car passing through the fuel filter (located in the engine bay) before being fed into the fuel rails. Fuel is then delivered to each cylinder one by one, starting with cylinder four.The fuel pressure regulator (situated at the end of your fuel rails) acts like a flood gate, backing up the fuel pressure to ensure a good supply is available for each cylinder. Experience and logic tells us that a far more efficient way of fueling the engine would be to supply each cylinder with its own equal amount of fuel, ensuring no cylinder is left "thirsty" compared to the rest. 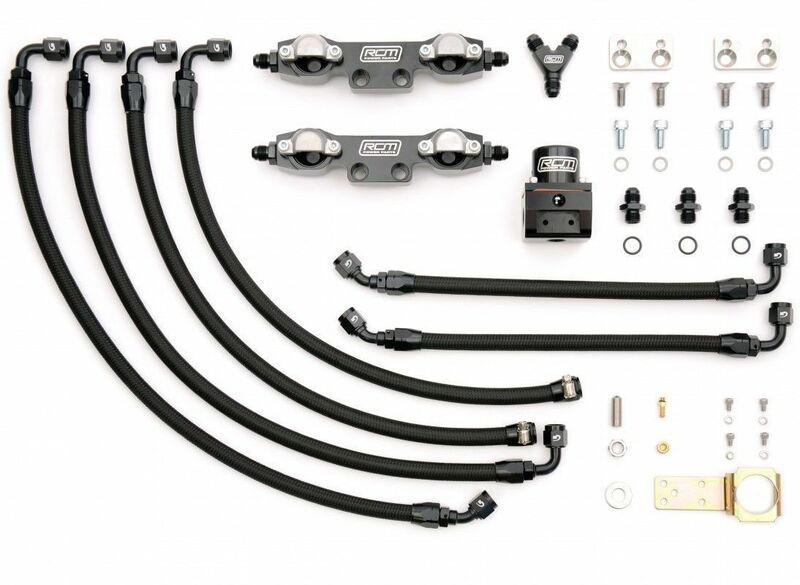 This is where a Parallel Fuel Rail design is a far more effective, safe and regulated way of fueling your engine. With RCM's Parallel Fuel Rail Kits fuel exits the fuel filter and is then passed through a Y-piece separator which directs fuel to each rail at the same time. Not only does this solve the problem of one cylinder running lean but it also enables the system to hold more fuel in reserve (thanks to the increased diameter fuel rails and lines). This particular kit is designed for use with modified vehicles where fuel control is paramount to maintaining power and engine safety. 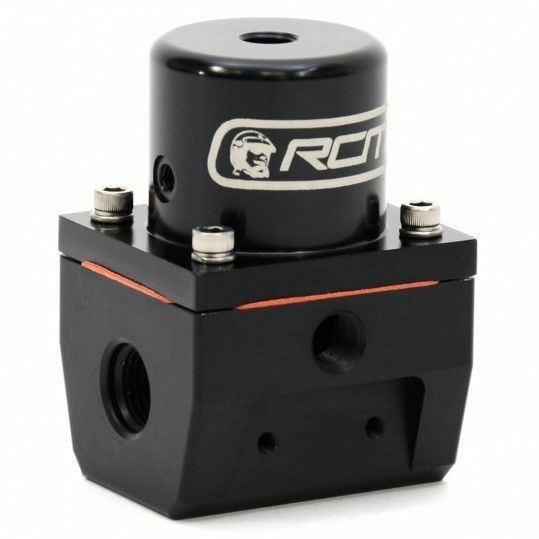 Our added Performance Fuel Pressure Regulator will allow maximum fuel control with absolute minimum flow restriction for engines up to and exceeding 1500 HP. Developed with Advanced Bypass Technology and an Enlarged Port Design to provide accurate fuel pressure control across the range, our regulator enables your fuel pump to push more, draw less current, and always meet fuel volume demands with no pressure creep. When fitting this kit we recommend your vehicle is remapped after installation to ensure all ECU fueling parameters are matched. 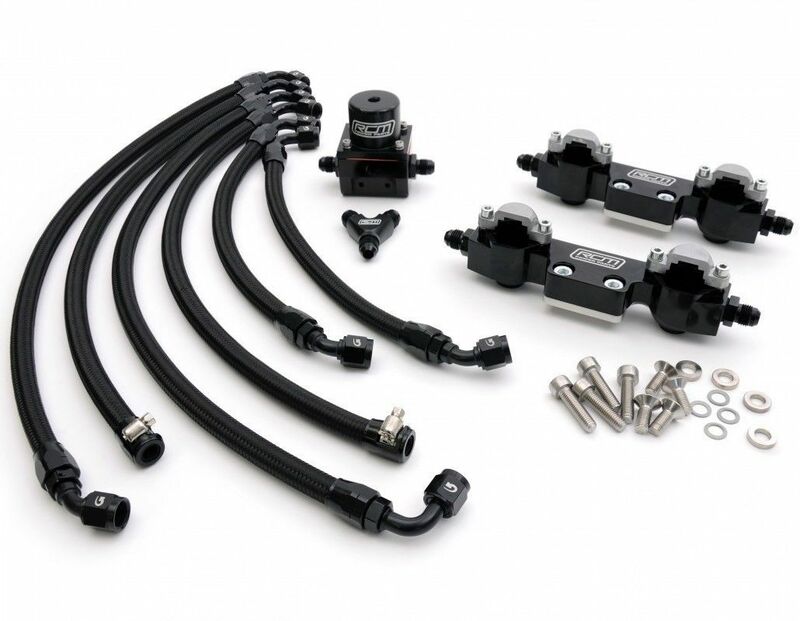 Precision cut from T6061 Billet Aluminium and finished in Military Grade Black Anodizing, each rail is supplied with anodized steel -6 shouldered male fittings ready to connect to your braided fuel lines. Also supplied within the kit are all necessary mounting brackets, stainless steel hex screws and rubber O-rings to enable a complete and thorough installation. Please note - These rails are intended to be used with standard Version 5 or uprated Version 5 Phase 2 type injectors. • Manufactured from T6061 billet aluminium. • Military grade anodized finish. • CNC machined aluminium mounting brackets. • Anodized Steel Male / Male fittings for each rail end (15mm shoulder to -6 thread). • X4 Nitrile Rubber O-Rings to seal each fuel rail end to its given fitting. • X4 Injector Caps and capsheads for securing the injectors in place. • Material: Goodridge 200 series -6 Braided Nitrile Hose. • Fittings: Swept Alloy (Cutter style, Re-usable), Alloy Hose End Finishers, Supplied pre assembled. 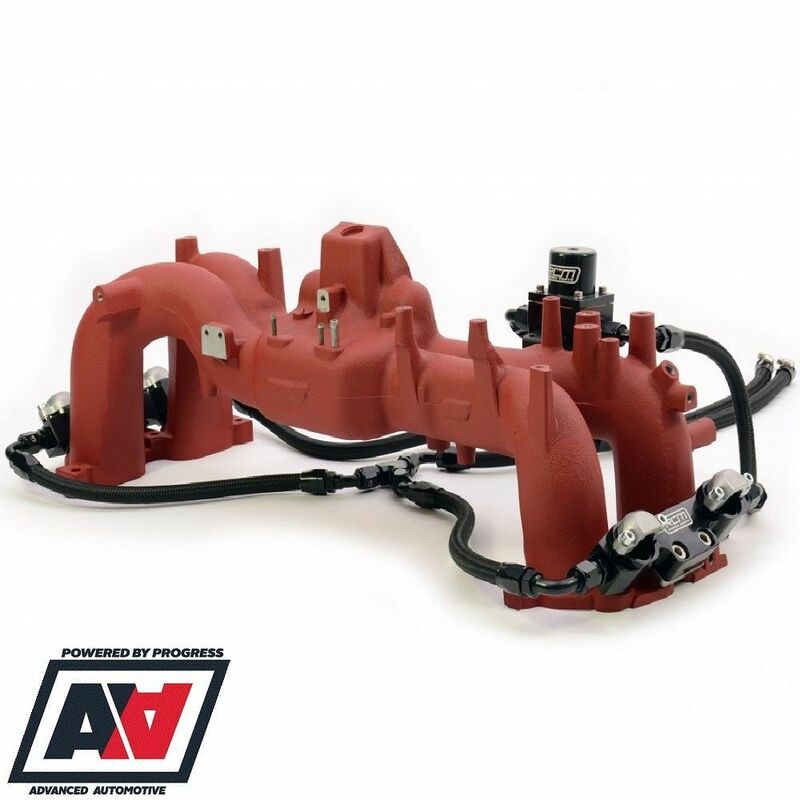 • Features a vacuum/boost compensating port for a supercharger, turbo, or intake manifold vacuum connection. • Holds fuel system pressure for at least 20 minutes after pump shutdown. • 1/8 inch NPT gauge port. • Coated with Military Specification MIL-A-8625 Anodize colour. • Ensure equal supply of fuel to each cylinder. • Complete control of fuel system pressure. • Allows a higher volume of fuel for immediate reserve. • Dramatically improves engine bay appearance. • Ideal for modified vehicles. We supply many performance parts from stock including genuine Subaru parts and quality products direct from Roger Clark Motorsport. We stock many leading brands and our mission is to supply our customers with everything they require and to give help and support the best we can. For non Subaru drivers we also specialise in Ford engine parts Ford X/flow Pinto Cosworth all of which we have many years experience and again using the same quality engine parts. Advanced Automotive Offer Free UK Delivery On All Orders Over £99. International Customers Should Enquire On Shipping Costs Before Purchase. © Copyright Advanced Automotive. All Rights Reserved.